(1971, aka VENDETTA AT DAWN) George Eastman, Ty Hardin, Guido Lollobrigida, Costanza Spada. Eastman returns to the ranch of his brother Jonathan (Hardin) to marry his fiancée. Unfortunately, she is soon kidnapped and the entire family is nearly massacred. 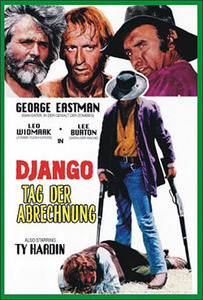 Eastman then sets out for some typical Spaghetti western revenge. Good action scenes. Widescreen, from 35mm.